Authors who have won or finaled in the Grace Awards, who have been judges, who are active members of the Grace Awards Face Book Group, or who have in other ways supported the Grace Awards are happy to show their Christmas spirit with this showcase of their novels at this joyous time of year. Christmas will never be the same when an evening at the ballet ends in a kidnapping. In order to rescue her sister, Megan must work with her nemesis, Nate, as they search from Northeast Florida to Key West in a race against time. My Sister’s Keeper is the debut novel of author Dalyn Woods. It is Christian Romantic Suspense written in the style of Harlequin’s Love Inspired Suspense line. Share an Appalachian Christmas with amateur sleuth Tess Spencer and her beloved in-laws who live next door. When Tess stumbles onto a decades-old unsolved murder, will she be able to stop the killer before the New Year rings in a new death? Fans of Terri Blackstock and Dani Pettrey will enjoy this bestselling first-in-series mystery. Imagine once looking forward to the Christmas holiday season with your new husband. You dream of future years filled with tree decorating, cookie baking, gift giving, and carol singing. Your heart flutters with joy when you think about the smiles on your children’s faces! You meet your Prince Charming who rescues you from danger, fall in love, and marry. And you’re blessed with a baby on the way. You get exactly what you wished for. Now, the truth comes out about your husband and the community you live with. You’re faced with two choices: Staying could endanger your child. Leaving could cost your life. ALWAYS WITH YOU, a novel of finding faith in a God who loves you for always … a Father who wants you and your children to celebrate an eternity of Christmases. A Kindle best-seller. Curl up beneath the Christmas lights in your favorite chair and lose yourself for a while in a beautiful story. One reader said, “The love of God for each and every one shone through,” and another, “Unique and unforgettable.” Penn Saunders, ex-drug addict and pastor’s son, meets Morgan Gant, a girl troubled by her recent past, in the most normal way, as neighbors. Penn, after a nameless girl he’d partied with died in his bed, got clean and embraced God again. He feels the call of the ministry on his life, but has to take the first step in living on his own. Morgan Gant thought she left her old life behind by moving hundreds of miles away. She’s starting over, building a successful online cosmetics business, and renting her own apartment. No one here will know what she did for a living, or what happened to her. Yet, when their feelings for each other grow, what they haven’t said, who he is as a Christian, clashes with the secret of what she’s survived, and their new relationship threatens to fall apart. Until God’s ever-present grace touches her heart. In this time of reflection, this story of redemption will tug at your heartstrings and remind you of the purpose of the holiday. “It’s my new favorite book!” That’s what one reader says about Trevelyan – A Tale of Beauty and The Beast, a fantasy vacation for the fairytale lover on your Christmas list. In a war long ago, the once great kingdom of Trevelyan was left in death and ruins by a monster lord and his faerie wife. Stories of that time have grown, mysteries hidden beyond the borders of an endless winter. Only the fairies of Evensong know the truth of those times. Until hope comes. Now it’s up to Belle, her swashbuckling brothers, two fearless suitors, and a pair of Elvin princes to discover the real malevolence still determined to destroy them all. Can a true king rule in Trevelyan again? Christmas. It’s the time for gifts–and gifts with chocolate abound. But do you know where your chocolate comes from? December is cacao planting season in the Côte d’Ivoire. It’s also the time that Christ’s redemption of mankind was set into motion. Why not gift the woman in your life with the book that marries these two concepts–Waters of Separation. She will love you for it. Africa’s secrets resurrect the despair physician assistant Anna Haas buried in America. 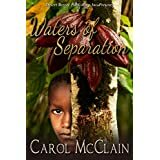 Her pregnancy and the discovery of boys bound by slavery in the cacao sector of the Côte d’Ivoire revive her childhood guilt. Her mother’s suicide claimed the lives of the two small sisters Anna had vowed to protect. Her failure to save them was unforgiveable. It will not happen with these boys. Her interference prompts a corrupt government to threaten the thriving mission and the lives of Anna and her friends. Her action also threaten her marriage. However, doing nothing will destroy her. The story weaves from past to present and across two continents as Anna fights for love, faith and redemption.